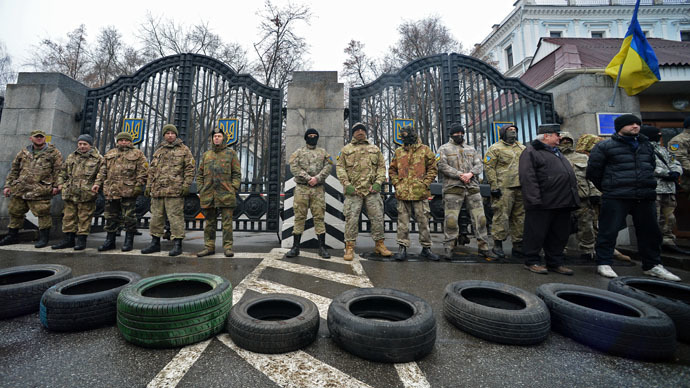 Camouflaged figures barricaded the Defense Ministry building in the Ukrainian capital after the government issued an order to formally disband Aidar, a volunteer unit accused of human rights violations in eastern Ukraine. Dozens of picketers stopped a passenger trolleybus, using it to block the official entrance. They then piled up tires outside and began to beat army drums, demanding an audience from ministry officials. When the request was ignored, demonstrators set fire to the tires, before taking down the Ukrainian flag mounted on the entrance. As the fire petered out, the demonstrators, matched in numbers by onlookers and media, gradually dispersed. This is the second violent protest in three days, following a government order to “re-register” the controversial battalion as another entity. An order was issued by the Ukrainian authorities to officially disband the battalion, which numbers about 400 fighters, on January 29. This provoked anger from its former leader and current Rada MP Sergey Melnichuk, who called for protest. Meanwhile, a Yulia Evdokimova, who claimed to be the press secretary of the unit, claimed that its leaders were being “purged” - sparking the initial demonstration on Saturday. Both sides have appealed to the main body of volunteers, who are deployed in intense firefights with militants in the Lugansk Region. Various videos have appeared in YouTube, with purported combatants either claiming loyalty to Kiev or alleging they have been “abandoned.” There have also been unconfirmed allegations of recent betrayals from senior commanders, who may have sold information about the location of their own, and other pro-government units. In September, Amnesty International accused Aidar of “widespread abuses, including abductions, unlawful detention, ill-treatment, theft, extortion, and possible executions.” The claims have been echoed by Human Rights Watch and the OSCE mission in the region. Officials in Kiev, who initially trumpeted the successes of paramilitaries as symbols of Ukraine’s patriotism, have recently become more wary, handing over important missions to official units, where possible. Kiev’s Chief Prosecutor Sergey Yuldashev went as far as labeling them “a major threat,” capable of overthrowing the new government.